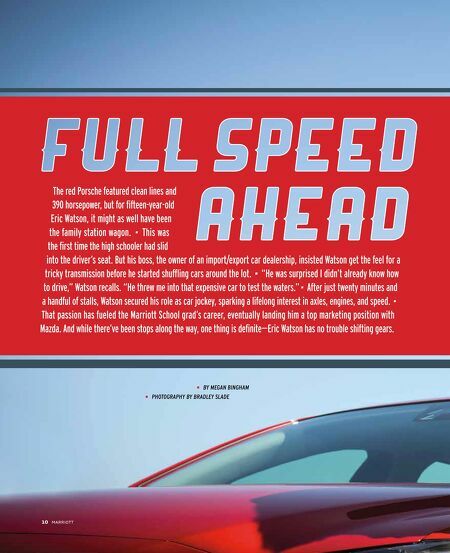 Full Speed Ahead by Megan Bingham Photography by Bradley Slade The red Porsche featured clean lines and 390 horsepower, but for fifteen-year-old Eric Watson, it might as well have been the family station wagon. This was the first time the high schooler had slid into the driver's seat. But his boss, the owner of an import/export car dealership, insisted Watson get the feel for a tricky transmission before he started shuffling cars around the lot. "He was surprised I didn't already know how to drive," Watson recalls. "He threw me into that expensive car to test the waters." After just twenty minutes and a handful of stalls, Watson secured his role as car jockey, sparking a lifelong interest in axles, engines, and speed. 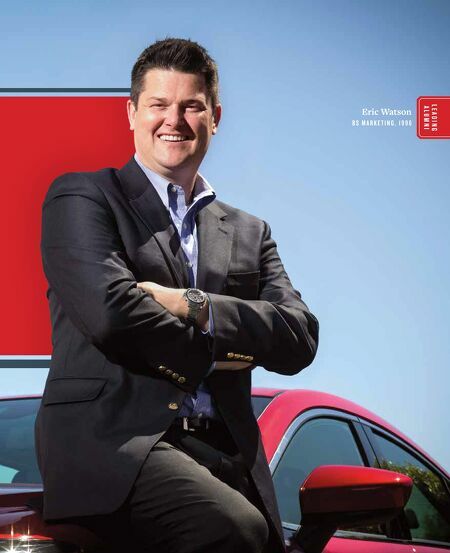 That passion has fueled the Marriott School grad's career, eventually landing him a top marketing position with Mazda. And while there've been stops along the way, one thing is definite—–Eric Watson has no trouble shifting gears.